Slice Brussels sprouts in half and stir together with 2 tablespoons olive oil. Place Brussels sprouts face down and roast for 20 to 25 minutes. For the last 5 minutes, flip Brussels sprouts over. Lightly grease baking sheet with 1 tablespoon olive oil. In a large bowl, mix together the butternut squash, 1 tablespoon oil, maple syrup and cinnmon. Place butternut squash on prepared pan and roast for 20 to 25 minutes. 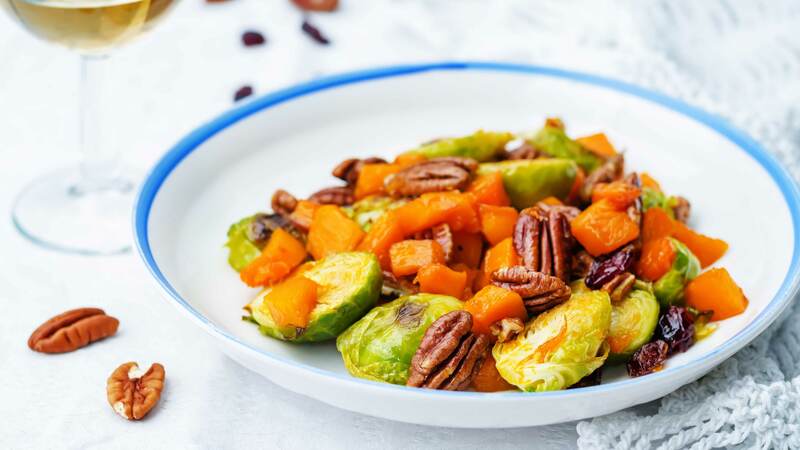 In a large bowl, mix the Brussels sprouts and butternut squash together. Add the pecans and dried cranberries and toss.